Calcium is one of the most prevalent ions in seawater, and is required for the formation of aragonite, the skeletal material of reef-building invertebrates such as corals, clams, tube worms, and their respective allies. In seawater, calcium is present at a concentration of approximately 412 ppm; in reef aquaria, maintaining calcium within a range of 412 - 450 ppm will enable corals and other reef-building invertebrates to grow rapidly when all other physical and chemical requirements are met. [Magnesium, strontium, and carbonate ions are also complexed into aragonite, and their importance in a reef aquarium cannot be overstated.] The rate at which calcium is extracted from the water is determined by the stocking density of reef-building livestock, type of lighting, and other biological, physical, and chemical conditions; therefore, each aquarium will have different requirements for the rate of calcium supplementation. Once the rate of calcium uptake in the aquarium has been determined, the proper dosing rate of this product can be easily calculated. It is recommended that a quality salt mix with the proper (not augmented) alkalinity and concentrations of major, minor, and trace elements be used to establish natural seawater parameters in the reef aquarium, providing a stable ionic foundation on which to build. Advanced: Determine the calcium concentration in the aquarium using an accurate test kit before supplementing. Shake this product well before each use. 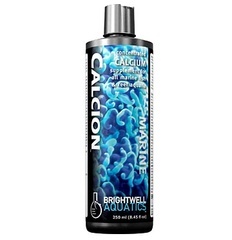 Each ml of CALCION will increase the concentration of calcium ("[Ca2+]") in 1 US-gallon (3.785 L) of water by approximately 29 ppm. If the initial [Ca2+] in the aquarium is below 412 ppm, add this product at the maximum rate of 10 ml per 20 US-gallons daily until the desired calcium concentration is attained, then dose daily or weekly as needed (see below). Always try to maintain the [Ca2+] within a range of +/-10 ppm. To determine the dosing rate of this product once the desired [Ca2+] has been acquired, measure the daily rate of calcium uptake (i.e. 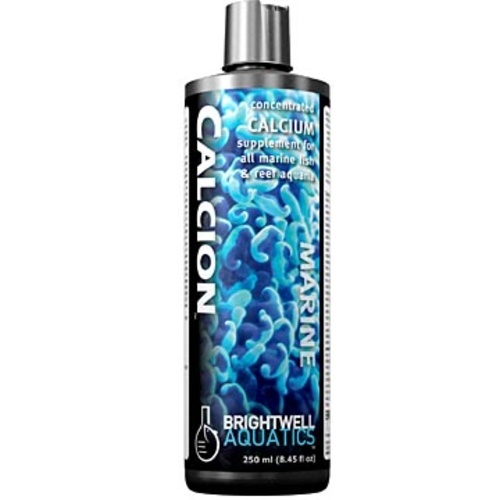 the decrease in calcium) in your aquarium by measuring the [Ca2+] at the same time each day over a one- to two-week period. To determine the daily dosing rate (preferable to weekly dosing) for calcium maintenance: estimate the volume of water in the entire aquarium system; divide the daily decrease in [Ca2+] by 29; multiply this number by the volume of water in the system to get the daily dosage required (ml) to maintain a stable [Ca2+]. Daily dosing maintains a more stable [Ca2+] (and more natural environment) than dosing weekly, in which the [Ca2+] spikes just after dosing and then gradually decreases throughout the course of the week.